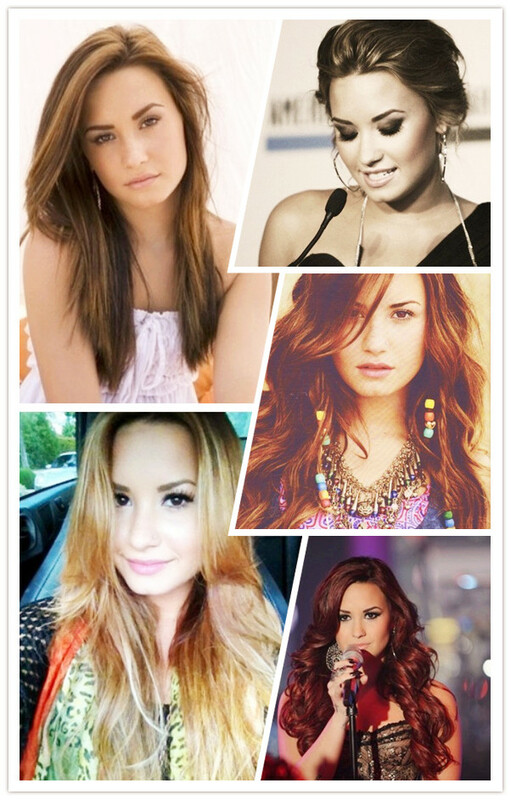 Demi Lovato is always gorgeous with all kinds of hairstyles. No matter she is wearing a straight haircut or a wavy hairstyle, no matter she parts her hair from the side or the center, she is just a diva. 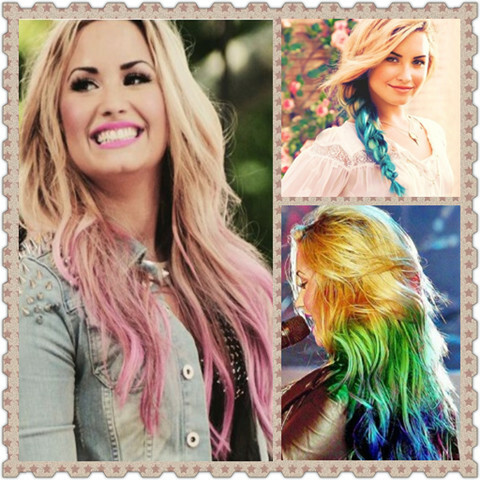 This time, we will take a review of Demi Lovato’s most beautiful hair looks. 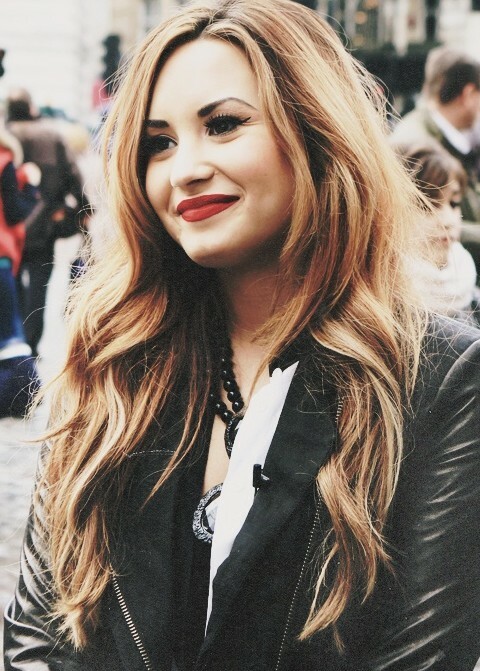 Demi dye her pretty locks into burgundy and then style them into long curls. She is classy. To go with linen outfits, she adds a beige headband to her hair, whiling leaving the fringe there. And then, the trendy look becomes cute. Look at Demi Lovato in this picture. She just looks like a beautiful mermaid. The messy fishtail braid looks so adorable and pretty. The bangs are swept to one side casually. There is only one word to describe the overall look, and that is gorgeous! Demi sports a long wavy hairstyle again. This time, the curls start from the roots of the hair and stretch to the ends. The voluminous curls look textured and high-fashioned. It is best suited for you to wear for some grand occasions. Demi Lovato wears her burgundy hair down in a shaggy way. A lot of texture and volume have been added to the hair to create a messy look. It becomes aesthetic with the flower headband on the crown. Demi Lovato shows off her pretty locks with these blonde waves. She tousles the hair in a messy way so that the overall look is casual-chic. You can rock this beautiful hairstyle when go out for fun. Turn to a braided updo for a stylish and elegant look! This braided updo is amazing and most suited for women who have thick hair. Demi shows off her long locks with an ombre hairstyle. The graduation from Modena to golden is dramatic and super-chic. Younger women can experiment with this edgy hairstyle when you for a night out! Here are another three fantastic hair looks with ombre hairstyles. I have to say they are edgy, and it’s great for the any casual occasions. 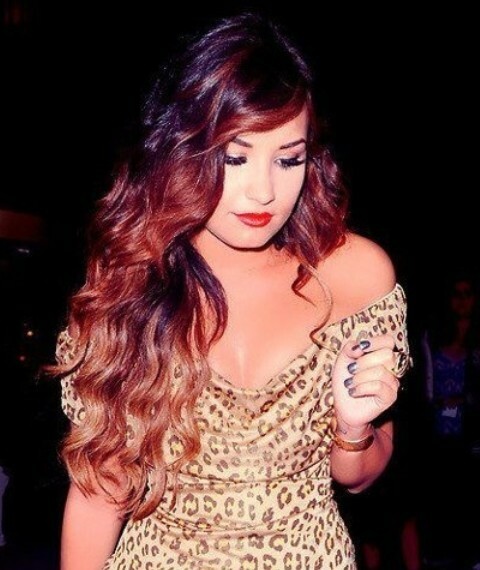 Demi wears her golden hair in long waves. The side-parted hairstyle looks alluring and feminine. Younger women and older women will all look fascinating with such a beautiful hairstyle. Add a headband that is in the similar color to your outfits, and then you can get a harmoniously fresh look. See Demi in this picture? She just looks like the girl-next-door. You can wear a similar hairstyle for a picnic or family gatherings. Demi looks so good-girl and adorable with this straight haircut. The straight have long layers but they are not distinct. The wispy bangs add life to the ultra-straight hair. This is a great haircut for any face shape to leave a good impression on others. An adorable girl can be elegant as well. 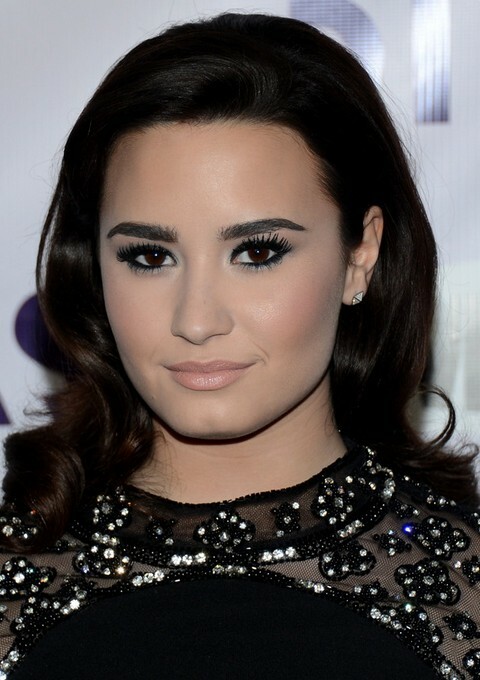 When Demi Lovato wears her hair in a voluminous updo hairstyle, she becomes mature and graceful in a minute. Two strands of curly twigs have been left hanging there, which add romantic vibe to the overall look. 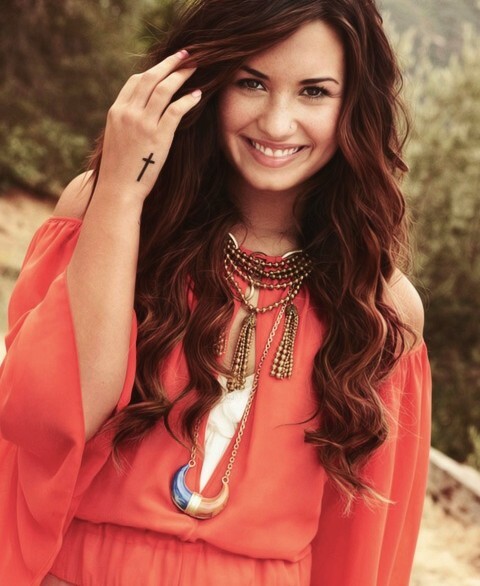 This time, Demi wears her hair in side-swept long curls. She looks radiant with this hairstyle. If you want to find a simple yet stylish hairstyle that can upgrade your look instantly, you should not miss this one! 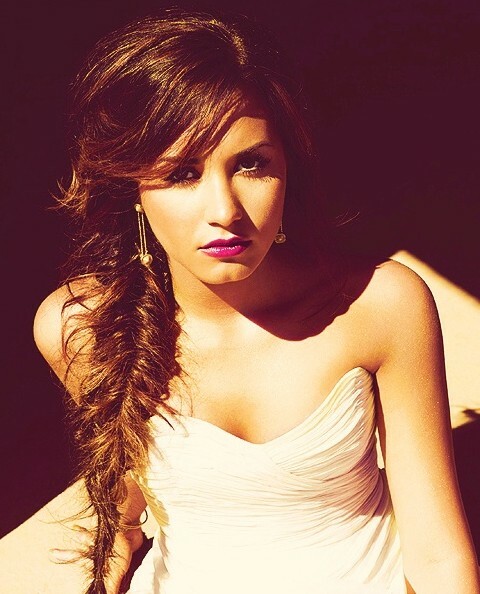 Demi rocks voluminous long curl in an ombre style. The intense curls add volume and life to the hair, and the loose fringe is swept to one side just glimpsing off one of the eyes. It’s pretty indeed. All face shapes are suited for this hairstyle. Tired of the long hairstyles? Chop off your hair into this wispy haircut! The side-parted bangs and the wispy waves are so edgy and casual-chic. This haircut is super-great for younger women who want to show off their own fashion statement. The big waves are really tempting and voguish. The soft and loose hair just touched Demi’s pretty face slightly. I have to say she is gorgeous with this hairstyle. Besides, this hairstyle adds volume to the hair and it is a great choice for women with thin hair. Demi styles her chocolate locks with a side-parted curly’ do! The dense curls look radiant and textured and the blonde shades on the upper section endow the hair with a sun-kissed look. All these make Demi glamorous! This is a fabulous haircut for younger women. Only one word can be used to describe this ombre long curls—Chic! Tousle you hair messily and casually, and then turn it into an ombre style. You can get this stylish hairstyle. 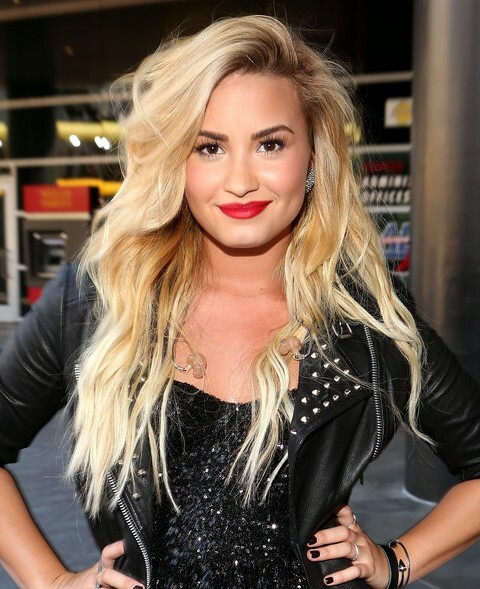 Demi rocks golden long curls to go with the black leather jacket. It’s so cool. You can wear you long hair in this way and you must be regarded as a super-star when walking on the street! Have you ever seen the blonde hair styled in this way? 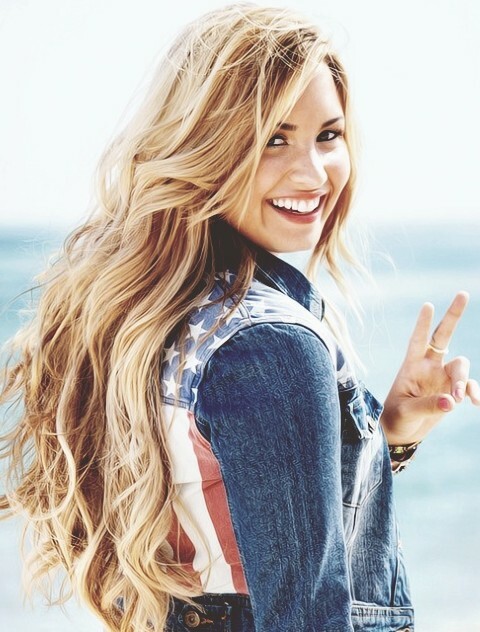 Demi parts her blonde locks from the side and tousles them messily. Some curls have been added to the hair. Finally, such a incredible hairstyle appears to us. Elegance is not the only taste of a French twist hairstyle. It can be edgy-chic as well. Take a look at this picture! 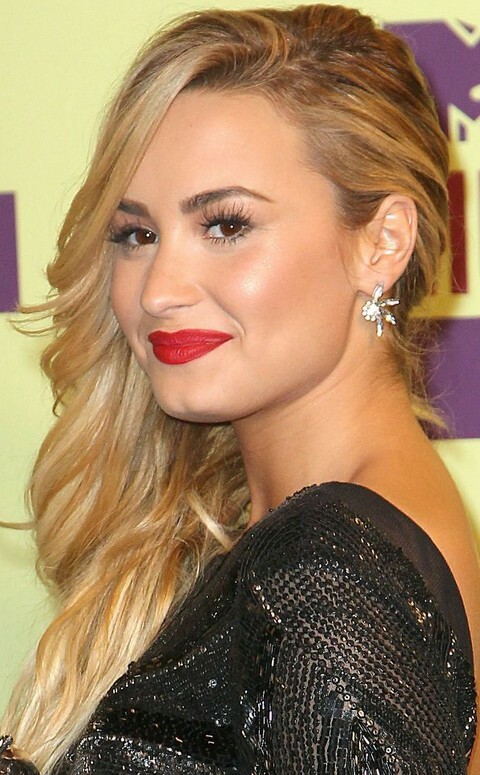 Demi combines the French twist with a faux hawk hairstyle, so a super-edgy updo has been created. You can rock this hairstyle on any formal occasions. 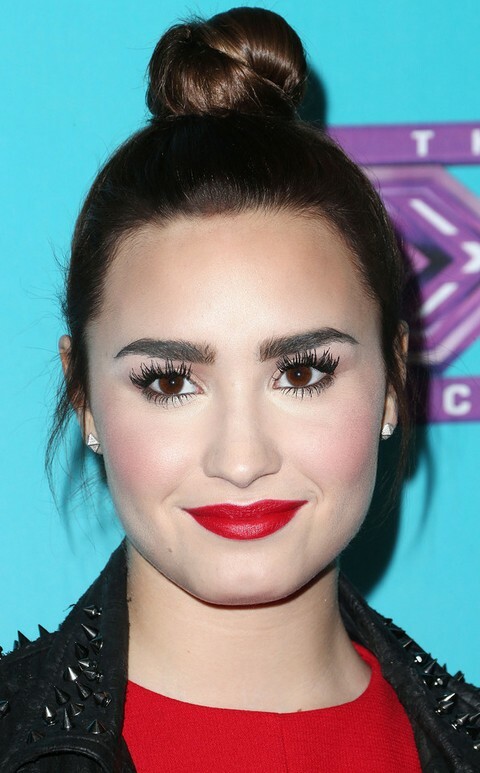 Loving Demi in this hairstyle and this makeup! She just wears her raven hair in medium curls to get a minimal look! The beauty of this hairstyle is understated and it’s great choice for older women. 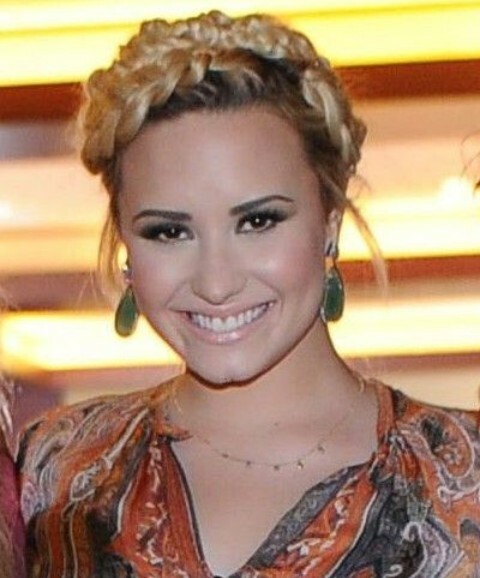 Demi goes for a cute look with this funny high bun. All locks are teased back in a sleek way. This interesting hairstyle is most suited for young girls to get a trendy look. 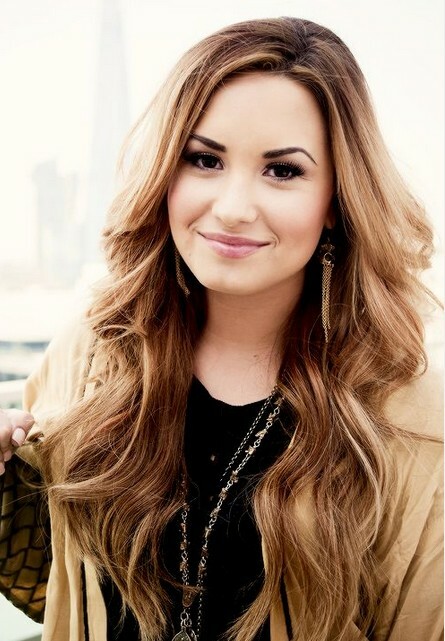 Demi looks radiant and confident with these dense medium curls. 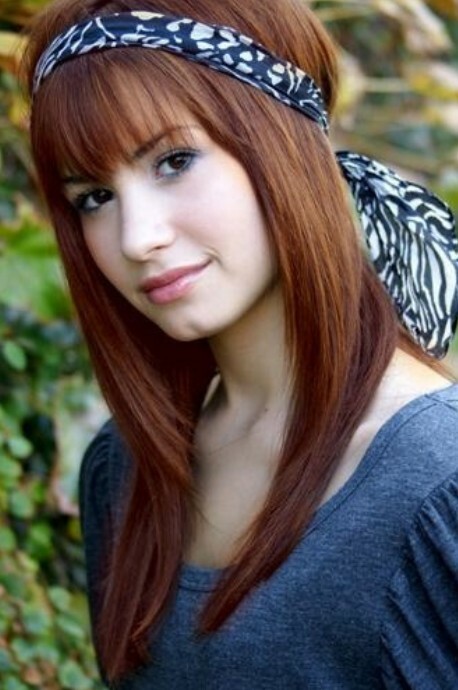 The side-parted bangs can frame the faces and they allow the overall look to be sweet and elegant. So, you can rock this decent hairstyle on any occasions. At last, let’s witness this blue and purple hairstyle. It’s originally a center-parted medium haircut. 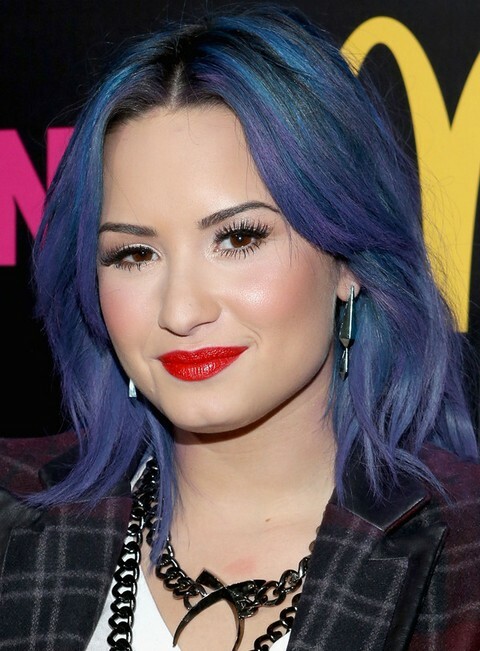 However, it becomes edgy-chic when Demi turn the hair color into purple and blue. This haircut may not be proper on formal occasions, but it’s still a wonderful choice for a festival look!